In general hardiness zones provide guidelines that help to determine the winter survivability of woody plants (trees, and shrubs). 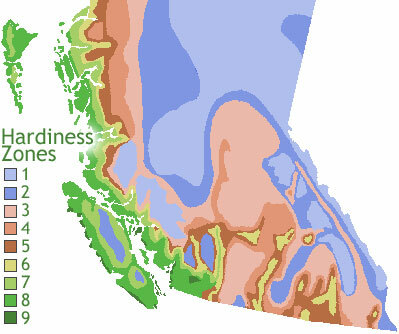 On the Canadian Zone Map the coldest zone is designated at 0 and the warmest is a 9 (some very small areas on Vancouver Island and the protected Southern Coast of Mainland B.C.). Vancouver is considered to be Zone 8. Many perennial experts believe the zones are not useful for rating the winter hardiness of perennials, because winter freeze-thaw patterns in warmer parts of the country can often kill plants that do just fine in colder regions where they are protected under a thick blanket of snow. Also, some plants that can withstand extremely cold but dry winters have difficulty surviving the West Coast’s rain-soaked winter soils. Drainage – soils that allow water to drain freely especially in winter. Microclimates – features that modify climate such as protected spots, exposed areas, elevation and north/south facing slopes, walls, and canyons. Selection of Site – right plant in the right place. Providing Winter Protection – mulching, insulating (in the case of pots), shelters (structures built around tender plants), wrapping. Windbreaks – hedges or screens to protect from cold or drying winds. Soil – soils should suit the plants requirements e.g. rich, moist, porous acidic soil for plants like Rhododendrons. Therefore determining which plants will thrive in the garden involves not only the hardiness zone of the plant but also careful attention to those factors that help in creating an hospitable environment for good plant growth.